To the park office: From Route 80, take Route 206 north approximately 8 miles through Andover Borough. Turn right onto Goodale Road and follow it approx. 1 mile to the park entrance on the right. 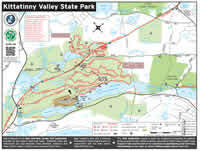 Glacial lakes, limestone outcroppings, former railroads, and a small airport are features of Kittatinny Valley State Park. Lake Aerof lex and Gardner’s Pond form part of the headwaters of the Pequest River and are excellent for fishing and boating. This scenic property is home to a variety of wildlife such as whitetail deer, wild turkey, a variety of songbirds, beaver, muskrats, and squirrels. Hunting, hiking, mountain biking, birding, and horseback riding are popular activities. The four lakes offer fishing, boating, and kayaking opportunities. The Paulinskill Valley Trail and the Sussex Branch Trail are former railroads that have been converted for use as multiple use trails. Both railroads were critical to the development of Sussex County through the late 1800’s and early 1900’s. The wide cinder surface is ideal for walking, running, mountain biking, and horseback riding. When snow conditions are abundant, these trails provide and excellent opportunity for cross-country skiing, and snowshoeing. You might even see a musher and his dogsled team running down the trail! The recreational facilities at Kittatinny Valley State Park are partially accessible for persons with disabilities. Please contact the park office for further information regarding disability access. Text telephone (TT) users, call the New Jersey Relay Service at (800) 852-7899. Park Office: Daily 9 a.m. to 4 p.m. Note: The Lake Aeroflex boat ramp is open 24 hours for fishing from boats. Trails in the park vary in difficulty and terrain from the gravel roads that are walked and biked by many to the technical terrain enjoyed by hard-core mountain bikers. Single track trails and gravel roads are suitable for hiking, mountain biking, cross-country skiing, snowshoeing, and horseback riding. A 2-mile self-guided nature trail provides a brief introduction to the park’s natural and cultural resources. Motorized vehicles are not permitted on any park trails. For most of its 27 miles, the trail passes through rural landscapes, northern deciduous forests and wetlands, and small towns in Warren and Sussex Counties. The trail cuts under the majestic Hainseburg viaduct, once part of the Erie Lackawanna Railroad. The trail has a wide, firm cinder base suitable for hiking, biking, horseback riding, and cross-country skiing. Over 100 different species of birds are identified in and along the trail corridor in an annual bird census conducted by members of the Paulinskill Valley Trail Committee. Six bridge crossings of the Paulinskill River provide scenic views of the river and some fishing access. 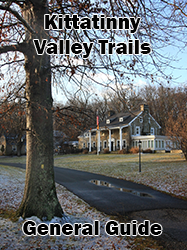 Monthly hikes on the Paulinskill Valley Trail are sponsored by the Paulinskill Valley Trail Committee, (973) 786-5768. This 20-mile trail skirts swamps, lakes, fields and several small communities. The trail corridor exhibits many features of the trail’s former existence as a railroad. Among them are graded fill areas, cuts through bedrock, underpasses that allow the passage of farm equipment and dairy cattle from one side of the tracks to the other, and bridges crossing the Pequest or Paulinskill Rivers. The flat cinder base of the trail permits multiple uses including hiking, horseback riding, biking, cross-country skiing and dog sledding. The trail provides access for fishing and for wheelchairs in certain areas. The Sussex Branch Trail also crosses through Allamuchy Mountain State Park. Waterloo Village grounds are open to the public for walking. Parking is permitted outside the gates. Waterloo Village takes the visitor through time from a 400-year old Lenape (Delaware) Indian village to a bustling port along the once prosperous Morris Canal. This early 19th-century restored village contains a working mill complex with gristmills and sawmills, a general store, blacksmith shop and several historic houses. Bursting with vibrant colors, Kittatinny Valley State Park is home to an award winning Butterfly and Hummingbird garden. Geocaching (pronounced “geo-cashing”) is an outdoor treasure hunting game enjoyed by adventure seekers of all ages around the world. Participants use a hand-held GPS (Global Positioning System)-enabled device to navigate to a specific set of coordinates and then attempt to find the "cache" hidden at that location. Geocaches come in a variety of sizes, though they are tradtionally metal or plastic water-tight containers containing trade items and a logbook to sign. In your daily travels, you probably pass dozens of geocaches just waiting to be found. They're hidden all around us in shopping centers, street signs, and picnic areas, as well as along scenic hiking trails throughout state, county, and local parks. Geocaching will take you to interesting and historic locations that perhaps you never knew existed. It helps you get back to nature, discover special places, and create stories along the way. Geocaching is also a great teaching tool for families who want to add a little excitement and education to their vacations by exploring and learning about new destinations. To participate in the adventure, a geocacher must login to the official geocaching website at www.geocaching.com and create a free basic account. To learn more about geocaching in New Jersey, visit the Northern New Jersey Cachers website at www.nnjc.org, or attend the monthly "Geocaching for Beginners" workshops at KVSP. Kittatinny Valley State Park is home to over 200 geocaches - there is an adventure out there for everyone, so grab your GPS and join in the quest to re-discover the Great Outoors! Calling all kids ages 7 through 12! Do you like to be outdoors? Do you like to have fun? Then stop by the park visitor center to find out how you can become a Kittatinny Valley State Park Junior Naturalist! Find out more! On rail trails, grades are minimal and there is access for people with disabilities in some areas. Motorized vehicles are not permitted on either trail. These trail corridors are narrow and lands beyond the trail corridor are generally privately owned. Please stay on the trail. Be aware of hunting seasons during the Fall and Winter as adjacent private or public lands may be open for hunting. As a courtesy, hikers/walkers should yield to bikers and all should yield to horses. Bikers should also give a verbal or bell warning to hikers or horses before overtaking them on the trails. Group campsites: Three group campsites containing picnic tables, grill, fire ring, drinking water, and composting toilets. Each campsite accommodates up to 21 people. Open April 1 to October 31. Fee: NJ Resident $42 per night; Non Resident $84 per night. Beginning May 17, 2006, the NJ Division of Fish and Wildlife introduced landlocked salmon to Lake Aeroflex to provide anglers with an opportunity to fish for this unique coldwater sport fish close to home. Only a handful of deep lakes in New Jersey have suitable year round habitat for coldwater fish like trout and salmon. Lake Wawayanda in Wawayanda State Park also received the landlocked salmon. Kittatinny Valley State Park contains 4 lakes to provide fishing and boating opportunities. Lake Aeroflex (119 Acres) is accessible by shoreline and via the boat launch ramp. Gardner’s Pond (39 Acres) may be reached on foot through the small plane parking area at Aeroflex-Andover Airport. Small boats may be transported by hand or small cart and launched from shore. Vehicular access is not available. Access for both lakes is from Limecrest Road in Andover Township. There are also kayaks, row boats and paddle boards for rent on Lake Areoflex. They are located next to the boat launch and are available from May to October. Twin Lakes is a 29-acre lake located off of Goodale Road in Andover Township. Anglers may access the lake via the car-top boat launch or from the shoreline. White’s Pond is reachable from the Sussex Branch Trail or from Goodale Road and is open for shoreline fishing only. All lakes are open for ice-fishing during the winter as conditions allow. Did I catch Trout or Salmon? Refer to the NJ Division of Fish and Wildlife's guide to help you distinguish between a trout and a salmon. You will need Adobe Acrobat Reader to view this file. 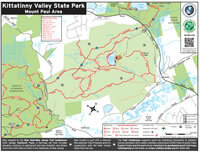 Hunting is permitted within Kittatinny Valley State Park, however hunting is not permitted on or from either rail trail. The core area of the park, west of Limecrest Road and east of Goodale Road, is also closed to all hunting. Areas of the park to the west of Goodale Road and to the east of Limecrest Road are open for all hunting seasons as described in the Fish and Wildlife Digest. Please contact the park office for a copy of the hunting flyer which details the open seasons and specifies the dates. A small number of picnic tables and grills are available near the parking area adjacent to Limecrest Road. Other picnic tables are scattered through the park. With over 8 miles of rugged mountain bike trails available, Kittatinny Valley State Park is a favorite of many hard-core mountain bikers. Volunteers from the Bulldog Mountain Bike Team regularly maintain trails in preparation for mountain bike races held in the park each year. The terrain is varied enough to be challenging to both novice and expert riders. The airport located within the boundaries of Kittatinny Valley State Park is owned by the State of New Jersey and operated by the New Jersey Forest Fire Service. It is used as a general aviation airport. Airplane watching is a popular pastime. During fire seasons, the airport serves as an air attack base to facilitate aerial attacks on forest fires using helicopters and commercial spray planes for water drops on forest fires. Aeroflex-Andover Airport is operated by the NJ Forest Fire Service as a general aviation airport and as a base for aerial forest fire suppression. (973) 786-5100. Please be aware that in an effort to comply with the NJDOT, Division of Aeronautics regulations at the Aeroflex-Andover Airport and to enhance the safety of visitors to Kittatinny Valley State Park, gates have been installed at the north end of the airport. Visitors will no longer be permitted to cross the runway along the southern shore of Lake Aeroflex. The gates are closed to all pedestrians, cyclists and horseback riders. Visitors may still enjoy the use of the Lake Aeroflex boat ramp and the adjacent picnic area via the Limecrest Road entrance. The park’s trails, office and other facilities are accessible via the main park entrance on Goodale Road. Call the park office with any questions at (973) 786-6445. How deep is Lake Aeroflex? At over 110’ in depth, Lake Aeroflex is the deepest glacial lake in the state. Do you allow hunting in the park? Hunting is permitted in the park and park users are urged to consult the hunting flyer available in the park office for season dates and locations. What kind of fish are in the lake? Brown trout, rainbow trout, largemouth bass, bluegills, landlocked salmon, and assorted panfish. Can I camp at Kittatinny Valley State Park? Three group campsites are open April 1 through October 31. Each site can accommodate up to 20 people. Amenities include picnic tables, grill, fire ring, and composting toilets. For forms and information on booking a campsite visit our: reservations page. Can I rent a boat/canoe/kayak, bike or horse at the park? No rentals are available in the park. Why can’t I go swimming in the lake? State park regulations prohibit swimming except at designated beaches with lifeguards on duty. None of the lakes at Kittatinny Valley State Park have designated beach areas.